This article is about the section of U.S. Route 50 in Maryland. For the entire route, see U.S. Route 50. MD 295 near Washington D.C.
U.S. Route 50 (US 50) is a major east–west route of the U.S. Highway system, stretching just over 3,000 miles (4,800 km) from Ocean City, Maryland on the Atlantic Ocean to West Sacramento, California. In the U.S. state of Maryland, US 50 exists in two sections. The longer of these serves as a major route connecting Washington, D.C. with Ocean City; the latter is the eastern terminus of the highway. The other section passes through the southern end of Garrett County for less than 10 miles (16 km) as part of the Northwestern Turnpike, entering West Virginia at both ends. One notable section of US 50 is the dual-span Chesapeake Bay Bridge across the Chesapeake Bay, which links the Baltimore–Washington metropolitan area with the Eastern Shore region, allowing motorists to reach Ocean City and the Delaware Beaches. US 50 has received numerous upgrades during its existence in Maryland, including the construction of the John Hanson Highway, which is also the unsigned Interstate 595 (I-595), its extension onto the Eastern Shore and replacement of U.S. Route 213 due to the construction of the Chesapeake Bay Bridge, and the full conversion of the eastern segment of the route into a four-lane divided highway. Many of the older alignments of US 50 are still part of the Maryland and US highway systems, such as U.S. Route 50 Business in Salisbury, Maryland. US 50 continues to be upgraded on the Eastern Shore. US 50 has two segments located in the state of Maryland totaling 149.67 mi (240.87 km). The 9.17-mile (14.76 km) western segment is a two-lane undivided road through rural mountain areas in Garrett County, heading into West Virginia at both ends. The 140.50-mile (226.11 km) eastern segment runs between the Washington, D.C. border in Prince George's County and the eastern terminus of the route at MD 528 and MD 378 in Ocean City as a multilane divided highway with some freeway segments. Between Washington, D.C. and Annapolis, US 50 follows a freeway called the John Hanson Highway, which is designated as unsigned I-595 between the interchanges with I-95/I-495 (the Capital Beltway) in New Carrollton and MD 70 in Annapolis. In Bowie, US 301 becomes concurrent with US 50 and unsigned I-595. East of Annapolis, US 50/US 301 continue east along a freeway called the Blue Star Memorial Highway. The two routes pass over the Chesapeake Bay on the Chesapeake Bay Bridge, linking the Western Shore and the Eastern Shore regions. After the bridge, US 50/US 301 head east across Kent Island before the freeway ends and the two routes split in Queenstown. From here, US 50 becomes an at-grade divided highway called Ocean Gateway and runs through rural areas of the Eastern Shore, heading south through Easton to Cambridge. The route turns southeast in Cambridge and continues through more rural land to Salisbury, which it bypasses to the north on a freeway called the Salisbury Bypass, a bypass road partly shared with US 13. Past Salisbury, US 50 becomes an at-grade divided highway again and continues east along the Ocean Gateway to Ocean City. US 50 serves as the main route between the Baltimore-Washington Metropolitan Area and the Eastern Shore, providing access to Ocean City and, by way of MD 404 and Delaware Route 404 (DE 404), the Delaware Beaches. As such, the route experiences heavy traffic in the summer months, with major congestion points including the Pearl Harbor Memorial Bridge over the Severn River in Annapolis, the Chesapeake Bay Bridge toll plaza, Easton, Cambridge, and the few miles leading into Ocean City. The peak travel periods in the summer are eastbound on Friday evenings, Saturday afternoons, and westbound on Sunday afternoons. The route is also a designated hurricane evacuation route out of Ocean City. US 50 in Maryland is a part of the main National Highway System between the Washington, D.C. border and the eastern terminus in Ocean City. US 50/I-595 has a high-occupancy vehicle lane (HOV) in each direction from west of the Beltway to east of US 301, a distance of 8 miles (13 km). Unlike other HOV lanes in the Washington metropolitan area, which are only restricted during rush hours, the HOV lanes on US 50 are restricted at all times. US 50 leaves Preston County in West Virginia and enters the state of Maryland in Garrett County. US 50 is routed along the old Northwestern Turnpike, presently named George Washington Highway after George Washington. The route heads southeast from the state line as a two-lane undivided road that passes through a mix of farmland and woods with some homes. The road curves east before it turns back to the southeast and comes to an intersection with US 219 in Red House. Past this intersection, US 50 runs through more farm fields before it heads into forests and ascends Backbone Mountain, turning northeast. The route passes some development at the summit before it descends the mountain, curving to the east. The road heads through forested areas with a few homes before passing fields. The route runs southeast through more woods and makes a sharp turn to the north. US 50 reaches an intersection with the southern terminus of MD 560 in Gorman and turns east to come to a bridge over CSX's Thomas Subdivision and the Potomac River. At this point, US 50 leaves Maryland and heads back into West Virginia at Gormania. US 50 passes through West Virginia, Virginia, and Washington, D.C. before it crosses back into Maryland at the eastern border of Washington, D.C. From here, the route continues west into Washington, D.C. as New York Avenue. From the Washington, D.C. border, US 50 heads into Prince George's County as the John Hanson Highway, a six-lane freeway. The road soon intersects the southern terminus of the Baltimore-Washington Parkway (unsigned MD 295) and MD 201 (which heads south to the Washington, D.C. border and becomes District of Columbia Route 295) at a hybrid interchange with a full cloverleaf and partial-Y elements. Following this, the US 50 freeway narrows to four lanes and heads east, running between MD 459 and an industrial area to the north and Amtrak's Northeast Corridor to the south and passing under the Alexandria Extension of CSX's Capital Subdivision. The road enters Cheverly and comes to an interchange with the southern terminus of MD 459 and Columbia Park Road that provides access to the Cheverly station along Washington Metro's Orange Line to the south; this interchange does not have a westbound exit. Past this interchange, the route curves northeast and runs between residential neighborhoods to the northwest and the Northeast Corridor and Orange Line tracks to the southeast. The freeway leaves Cheverly and comes to the MD 202 exit, which is a combination of partial cloverleaf and trumpet interchanges. US 50 continues through suburban areas alongside the railroad tracks, passing near the Landover station along the Orange Line that can be accessed from MD 202. The road heads through a section of Landover Hills and widens to six lanes, reaching a diamond interchange with MD 410. Past this interchange, the freeway turns east and passes over Amtrak's Northeast Corridor and Washington Metro's Orange Line. The route comes to an interchange with Garden City Drive (MD 950) and Ardwick Ardmore Road (US 50PA) that provides access to the New Carrollton station serving Amtrak trains, MARC's Penn Line, and the terminus of Washington Metro's Orange Line to the north of the road; this interchange does not have an eastbound exit. Following this interchange, US 50 passes office parks and industrial development in New Carrollton. The highway reaches a hybrid turbine interchange with I-95/I-495, the Capital Beltway. At the I-95/I-495 interchange, the US 50 freeway becomes part of the Interstate Highway System as I-595, which is an unsigned highway. The road heads east as an ten-lane freeway, with the left lane in each direction designated as a high-occupancy vehicle lane (HOV lane). The freeway passes near residential development and comes to a partial cloverleaf interchange with MD 704 near Lanham. After this interchange, the highway narrows to eight lanes, with the left lanes remaining an HOV lane, and runs between commercial development to the north and housing subdivisions to the south. US 50 continues east through woodland with nearby residential areas, passing over MD 193 without an interchange. Farther east, the route runs through wooded areas with more scattered residential development, heading to the north of Freeway Airport. The road turns to the northeast and comes to a bridge over CSX's Pope's Creek Subdivision before it crosses into Bowie and reaches the MD 197 exit, which is a partial cloverleaf interchange. Past here, US 50 curves east and runs between residential neighborhoods before it comes to a modified cloverleaf interchange with US 301 and the southern terminus of MD 3. At this interchange, the HOV lanes end and US 301 heads east concurrent with US 50 and unsigned I-595 on the freeway, which narrows to six lanes. The road passes south of an industrial park before it leaves Bowie and enters woodland, coming to a bridge over the Patuxent River. Upon crossing the Patuxent River, US 50/US 301 and unsigned I-595 head into Anne Arundel County and continue through wooded areas with some farm fields, bending to the east-northeast. The road comes to a partial cloverleaf interchange with MD 424 to the north of Davidsonville. From here, the freeway runs through forested areas with some nearby housing developments, crossing the South River. The freeway curves to the east and heads near more dense residential development before it reaches a directional T interchange with the southern terminus of I-97, which leads north toward Baltimore. Past this interchange, the ramps leading to and from I-97 run parallel to US 50/US 301 to an interchange with the western terminus of MD 665, which runs southeast into Annapolis as a short freeway spur. From here, the highway heads into Parole and runs through a business area, coming to a partial cloverleaf interchange with MD 450, which leads into downtown Annapolis, to the south of the Westfield Annapolis shopping mall. The freeway soon intersects MD 2 at a partial cloverleaf interchange at Solomons Island Road. At this point, MD 2 joins US 50/US 301 and unsigned I-595 on the John Hanson Highway. The road heads northeast through wooded areas before coming to an interchange with MD 70 that serves downtown Annapolis. At this interchange, the unsigned I-595 designation ends, while US 50, US 301, and MD 2 continue northeast on the John Hanson Highway. The route passes under MD 436 and runs near residential neighborhoods before crossing over the Severn River on the Pearl Harbor Memorial Bridge. After crossing the Severn River, the road comes to an interchange with the Governor Ritchie Highway. Here, MD 2 leaves US 50/US 301 by heading north on the Governor Ritchie Highway toward Baltimore while MD 450 continues south into Annapolis on that road, providing access to the United States Naval Academy. Past this interchange, US 50/US 301 become Blue Star Memorial Highway and pass to the south of Arnold, coming to a westbound right-in/right-out (RIRO) intersection serving MD 648 and continuing northeast through wooded areas with some businesses adjacent to the road. The freeway comes to the Bay Dale Drive exit before it runs through woods and curves to the east. The road becomes paralleled by Buschs Frontage Road (MD 908A), a frontage road, to the south prior to reaching an interchange with MD 179 to the south of Cape St. Claire. Past this interchange, the US 50/US 301 freeway is paralleled by the East College Parkway (MD 908B) frontage road to the north and the Whitehall Road (MD 908C) frontage road to the south as it passes a few businesses, coming to an eastbound exit and entrance connecting to Whitehall Road. The route continues through woodland with a residential neighborhood to the north before it heads to the north of a shopping center and reaches an eastbound RIRO intersection serving Whitehall Road. The road runs through more woodland with some homes before it turns southeast and comes to a modified cloverleaf interchange with Oceanic Drive (MD 908D) in Skidmore that provides access to Sandy Point State Park to the east. Following this interchange, maintenance of the road changes from the Maryland State Highway Administration to the Maryland Transportation Authority and it reaches the eastbound toll plaza for the Chesapeake Bay Bridge and a westbound weigh station. From here, US 50/US 301 continue southeast and leave the Western Shore by heading onto the Chesapeake Bay Bridge, which soon curves to the east as it passes over the Chesapeake Bay. The bridge is a dual-span crossing with an eastbound suspension and cantilever span and westbound suspension and through arch span, carrying two eastbound lanes and three westbound lanes that can be reversed to allow for two-way traffic on one span by way of crossovers on either side of the bridge. After crossing the Chesapeake Bay on the Chesapeake Bay Bridge, US 50/US 301 head onto the Eastern Shore on Kent Island in Queen Anne's County. The road continues east as the Blue Star Memorial Highway, a six-lane freeway, and maintenance returns to the Maryland State Highway Administration. The freeway comes to a diamond interchange with MD 8 and heads to the south of Stevensville through business areas, with MD 835A parallel to the south. The route reaches an eastbound RIRO intersection with Thompson Creek Road and a westbound RIRO intersection with Duke Street. From here, US 50/US 301 head east across Cox Creek and run between businesses to the north and residential areas to the south in Chester, with a westbound exit and entrance with the US50QC frontage road providing access to the businesses. The highway comes to an eastbound RIRO intersection with Cox Neck Road and a westbound RIRO intersection with Castle Marina Road (MD 18H), the latter of which provides access to MD 18 to the north. The road continues through commercial areas and passes under MD 18 before it comes to an eastbound RIRO intersection with the northern terminus of MD 552 and a westbound RIRO intersection with Chester Station Road (MD 552A), with Chester Station Road providing a connection to Piney Creek Road. The freeway runs between woods and marshes to the north and businesses to the south prior to an eastbound RIRO intersection with South Piney Road and a westbound RIRO intersection with Piney Creek Road. The route passes near more development and comes to an eastbound RIRO intersection with Dundee Avenue before a bridge over Piney Creek. US 50/US 301 reaches an interchange with MD 18, with access to and from the westbound lanes provided by Piney Narrows Road. Following this interchange, the freeway heads across the Kent Narrows on the Kent Narrows Bridge, with MD 18 parallel to the south. At this point, the route heads onto the mainland and passes between two marinas before it comes to an eastbound RIRO intersection with Seward Marina Road (MD 835) and a westbound RIRO intersection with Kent Narrows Road (MD 835G), both providing access to MD 18, in the community of Kent Narrows. The road passes through marshland before heading near homes and businesses and reaching an eastbound RIRO intersection with MD 18F, which connects to MD 18, and a westbound RIRO intersection with Jackson Creek Road (MD 18U) in Grasonville. US 50/US 301 continue east past development and come to an interchange with Chester River Beach Road (MD 18V); this interchange does not have a westbound exit. From here, the freeway runs through wooded areas prior to reaching an eastbound RIRO intersection with Station Lane (MD 18I) and a westbound RIRO intersection with VFW Avenue (MD 18W). The road curves northeast and heads near residential and commercial areas, with an eastbound RIRO intersection at Evans Avenue (MD 18Z) before an eastbound RIRO intersection at Hess Road (MD 18X) and a westbound RIRO intersection at Hissey Road (MD 835I). The route reaches an interchange with Nesbit Road (MD 835K), which serves the University of Maryland Shore Emergency Center at Queenstown and the University of Maryland Shore Medical Pavilion at Queenstown to the south of the road, before it runs through woodland. US 50 and US 301 split at a half-trumpet interchange near Queenstown, with US 301 continuing northeast along the carriageways on the Blue Star Memorial Highway towards Delaware. Upon splitting from US 301, US 50 heads east as the Ocean Gateway, a four-lane, at-grade divided highway. A short distance after the US 301 split, the route comes to an intersection with MD 18. The road runs between the Queenstown Premium Outlets to the north and a few businesses to the south before it heads into wooded areas with some farm fields. US 50 curves to the east-southeast and reaches a junction with the southern terminus of MD 456. The road continues southeast through agricultural areas with some woods and homes. Farther southeast, the route comes to an intersection with the northern terminus of MD 662, which leads south into Wye Mills. US 50 bends to the east-southeast and continues through farmland, passing to the north of Chesapeake College before it reaches the junction with MD 213, which heads south to Wye Mills and north to provide access to US 301 and the towns of Centreville and Chestertown. Following this, the road curves southeast as it runs through a mix of farm fields and woodland. The route turns due south and comes to an intersection with MD 404, which heads west to Wye Mills and east to provide access to Denton and, along with DE 404, the Delaware Beaches. This intersection has park and ride lots on the northwest and northeast corners. Upon crossing MD 404, US 50 enters Talbot County and continues due south through open agricultural areas with a few homes. The road runs through a mix of farmland and woodland and reaches an intersection with the south end of the Wye Mills segment of MD 662. A short distance later, another section of MD 662 branches southeast from the route to head into Skipton. US 50 continues through farm fields and woods with some residential and commercial development, crossing MD 662. The road heads south through more rural land with occasional development to the east of Longwoods. Farther south, the route passes to the west of a golf course before it enters Easton. At this point, US 50 becomes closely parallel with MD 662 to the west and reaches an intersection with the southern terminus of MD 309. Past this intersection, the road heads between MD 662 and the Easton Airport to the west and commercial development to the east. MD 662 curves away to the west and the route runs between residences to the west and businesses to the east. The median of US 50 widens as it reaches an intersection with the northern terminus of MD 322, which serves as a western bypass of Easton and provides access from US 50 to the western Talbot County communities of Oxford, St. Michaels, and Tilghman Island. Following this intersection, the road crosses an abandoned railroad grade owned by the Maryland Department of Transportation before the median of the route narrows again and it passes through a mix of farm fields and commercial development. The road widens to six lanes and becomes lined with businesses as it heads through the eastern part of Easton, coming to an intersection with the western terminus of MD 328. Farther south, US 50 reaches a junction with the northern terminus of MD 331. Following this intersection, the roadway runs through residential and commercial areas, narrowing to four lanes. The route continues past more businesses, bending to the south-southwest, before it heads to the east of Easton High School. US 50 passes through a mix of fields and commercial areas before reaching a junction with the southern terminus of the MD 322 western bypass of Easton. At this point, the route leaves Easton and heads south through a mix of farmland and woodland with some businesses. US 50 has an intersection with the northern terminus of MD 565, which runs north-south to the west of US 50. The road continues south-southeast through a mix of agricultural areas and woods with some homes and businesses. Farther south, the route curves to the south and enters Trappe, heading through residential and commercial areas in the eastern part of the town. At the south end of Trappe, US 50 intersects Main Street, which heads north through the center of town and becomes MD 565 on the northern edge. From here, the road leaves Trappe and runs south through a mix of farmland and woodland. The route curves southeast as it continues through rural land. US 50 turns to the south-southwest and passes through a mix of fields and woods with some homes before it comes to the Choptank River. Here, the route intersects Marina Drive (MD 954A), which provides access to a marina on the river to the west of the road. US 50 passes over the wide Choptank River on the Senator Frederick C. Malkus Bridge. Located parallel to the east of the bridge is Bill Burton Fishing Pier State Park, which consists of the former two-lane US 50 bridge over the river that was converted into two fishing piers, with the center section of the bridge removed. After passing over the Choptank River on the Senator Frederick C. Malkus Bridge, US 50 enters Cambridge in Dorchester County and becomes Sunburst Highway, a six-lane divided road that is lined with businesses, heading to the east of the downtown area. The route curves to the southeast and reaches an intersection with the eastern terminus of MD 343. The road passes more commercial development before it leaves Cambridge at the Woods Road intersection, where the name returns to Ocean Gateway. US 50 runs between a golf course and resort to the north and businesses to the south before it comes to a junction with MD 16. At this point, MD 16 turns east for a concurrency with US 50 and the road continues east near businesses. The road intersects the western terminus of MD 750, a former alignment of the route that loops to the north, at which point it narrows to four lanes. The route continues past a mix of homes and businesses, coming to the eastern terminus of MD 750. From here, Aireys Spur Road loops to the south and the road runs east through a mix of farmland and development. MD 16 splits from US 50 by heading northeast on Mount Holly Road toward East New Market. From here, US 50 continues east through a mix of farm fields and woodland with some residential and commercial development, with Chateau Drive looping to the south and then Hicksburg Road looping to the north. The route curves to the southeast and reaches Linkwood, where Vincent Road runs parallel to the west and the route passes businesses, crossing the Maryland and Delaware Railroad's Seaford Line at-grade. The road traverses more farmland and woods southwest of the Linkwood Wildlife Management Area. US 50 curves to the east, with Mill Road looping to the northeast, and passes north of Salem, with Salem Road looping south to serve that community. The route continues through rural land, with Maiden Forest Road looping to the north and the highway making a turn to the southeast. Farther southeast, the road comes to an eastbound exit and entrance with Old Ocean Gateway, which heads southeast into Vienna. At this point, US 50 curves east into wooded areas and bypasses Vienna to the north. The route comes to a partial cloverleaf interchange with the southern terminus of MD 331 that provides access to Vienna. Following this, the road passes over MD 331 and an abandoned railroad right-of-way owned by Delmarva Power and Light Company before it heads through fields to the south of a lake, curving to the southeast. The route crosses over the Nanticoke River on the Nanticoke River Memorial Bridge. Upon crossing the Nanticoke River, US 50 heads into Wicomico County and runs through marshland before heading into forests and turning to the south. The route intersects Old Bradley Road (MD 731C), which provides access to an eastbound inspection station for buses and trucks. The road has an intersection with Marsh Road (MD 731A), a one-way road coming from the inspection station, and curves to the southeast. US 50 continues through a mix of farmland and woodland with some residential and commercial development, turning to the east as it passes north of a roadside picnic area. The route heads into Mardela Springs and passes to the north of the residential areas of the town. US 50 reaches an intersection with the southern terminus of MD 313, which heads east a short distance to the western terminus of MD 54 before turning north. From here, the road leaves Mardela Springs and runs through more rural land with some development. The route passes through open agricultural areas with some woodland and homes, curving to the southeast. US 50 intersects the northern terminus of MD 347, which heads southwest into Hebron. A short distance later, the route has a junction with the eastern terminus of MD 670, which leads west into Hebron. From here, the road runs through more rural areas with some residences and commercial establishments. US 50 comes to an eastbound exit and westbound entrance with US 50 Bus., which heads southeast into Salisbury along Ocean Gateway. At this point, US 50 becomes a four-lane freeway called the Salisbury Bypass that bypasses Salisbury to the north and east. From here, the route continues east and reaches a diamond interchange with Naylor Mill Road (US 50UA). Following this interchange, the freeway heads through wooded areas with some nearby residential development, coming to a bridge over the Wicomico River. The road passes through the Northwood business park on an earthen viaduct, crossing over the Delmarva Central Railroad's Delmarva Subdivision before coming to an eastbound exit and westbound entrance with Northwood Drive. Past this interchange, US 50 comes to an interchange with US 13 and the northern terminus of US 13 Bus. at Salisbury Boulevard in a business area to the southwest of The Centre at Salisbury shopping mall. At this point, US 13 becomes concurrent with US 50 on the Salisbury Bypass, and the two routes head east through a mix of farmland and woodland with some homes. The freeway curves to the south and passes over the Delmarva Central Railroad's Willards Industrial Track and MD 346 without an interchange. The road comes to a partial cloverleaf interchange with the eastern terminus of US 50 Bus. at Salisbury Parkway, at which point US 50 splits from the Salisbury Bypass to continue east as Ocean Gateway and US 13 continues south along the Salisbury Bypass. US 50 continues east along Ocean Gateway, a four-lane, at-grade divided highway with a wide median, and passes to the north of Arthur W. Perdue Stadium, the home ballpark of the Delmarva Shorebirds baseball team. The route intersects Hobbs Road and heads through commercial areas, with the John Deere Drive (MD 992A) frontage road parallel to the south. The road runs through woods before heading near more commercial development, passing to the north of Wor-Wic Community College past the Walston Switch Road intersection. US 50 traverses forests before running through a mix of farmland and woodland, reaching an intersection with Parsonsburg Road, which leads north to Parsonsburg, and Eastside Road (MD 992B). The route continues east through more rural land and comes to a junction with the southern terminus of MD 353, which heads north into Pittsville. The road runs through farmland with some woods, with MD 346 parallel a distance to the north. US 50 reaches an intersection with MD 354, which heads north into Willards. From here, the route continues into wooded areas and crosses the Pocomoke River. After passing over the Pocomoke River, US 50 enters Worcester County and runs through more wooded areas before coming to an intersection with MD 610, which heads north to Whaleyville. Following this, the road curves to the southeast and passes through a mix of farmland and woodland. The route comes to an eastbound exit and westbound entrance with the western terminus of MD 90, a two-lane expressway that provides access to the northern part of Ocean City. From here, US 50 continues through rural land and heads into open agricultural areas as it reaches a junction with MD 346. Past this junction, MD 346 runs closely parallel to the southwest of the route until the intersection with Caleb Road (MD 992F), where MD 346 curves to the south-southeast toward Berlin. US 50 runs through a mix of farmland and woodland as it passes to the north of Berlin. The road comes to an intersection with MD 818, which provides access to Berlin. A short distance later, US 50 comes to a grade crossing with the Maryland and Delaware Railroad's Snow Hill Line as it reaches a cloverleaf interchange with US 113, with the ramps from eastbound US 50 to southbound US 113 and from southbound US 113 to westbound US 50 also crossing the railroad tracks at-grade. Following the US 113 interchange, US 50 runs through woods before it heads between farmland to the north and businesses to the south as it intersects the eastern terminus of MD 346. At this point, the median narrows and the road bends to the east-northeast. The route runs through more agricultural areas with some businesses and passes north of Stephen Decatur High School as it comes to a junction with the southern terminus of MD 452. US 50 runs through a mix of farms and woods with some commercial development, becoming closely parallel with MD 707 to the north before that route heads further to the north. The road curves to the east-southeast and MD 707 comes closely parallel again before it intersects the southern terminus of MD 589, which heads north to provide access to the Ocean Downs casino and harness racetrack and Ocean Pines, at Grays Corner. The route passes between a shopping center to the southwest and MD 707 and a golf course to the northeast, with MD 707 ending near the intersection with Riddle Lane (US 50WA). US 50 heads through a mix of woodland and businesses, curving to the east and then the east-northeast as another section of MD 707 is located a short distance to the north, with US 50WB and US 50WC heading north to connect to MD 707. The road runs through wooded areas of residential and commercial development before coming to a bridge over Herring Creek. Past the creek, the route intersects another section of MD 707 that heads southeast near the Greater Ocean City Chamber of Commerce visitor center. At this point, US 50 continues east into West Ocean City, lined with businesses. The road curves to the east-southeast and has a junction with the northern terminus of MD 611, which heads south to provide access to the Ocean City Municipal Airport and Assateague Island. Past this intersection, US 50 runs past more businesses, passing to the south of the Tanger Outlets Ocean City outlet mall and to the north of the West Ocean City Park and Ride. The route becomes a four-lane undivided road and crosses over the Sinepuxent Bay on the Harry W. Kelley Memorial Bridge, a drawbridge. After crossing the bay, US 50 continues into the downtown area of Ocean City and passes near residential areas before heading near businesses and coming to its eastern terminus. Here, the route intersects MD 528, which runs one-way southbound on Philadelphia Avenue, where the westbound lanes of US 50 begin. Eastbound US 50 continues east on North Division Street, which carries two lanes of one-way traffic. One block later, eastbound US 50 reaches its eastern terminus at MD 378, which runs one-way northbound on Baltimore Avenue, one block west of the Ocean City Boardwalk along the Atlantic Ocean. Heading west on US 50 out of Ocean City, an overhead sign lists the distance to the western terminus of the route in Sacramento, California as 3,073 miles (4,946 km). The sign reflects the length of US 50 at the time the sign was posted in the early 1980s. Due to changes to the route since then, the length listed is no longer accurate, as US 50 is about 3,008 miles (4,841 km) long. While the portion of US 50 in Garrett County has remained largely unchanged, the eastern portion has changed significantly since the route was established in 1926. On the Western Shore, US 50 was on the alignment currently known as MD 450. It ended at Church Circle in Annapolis, near St. Anne's Church. Beyond the end of US 50 was a ferry which connected the route to what was then Maryland Route 17 on the Eastern Shore, in Talbot County. Just before the Chesapeake Bay Bridge's completion, in 1948, the route was extended to Ocean City. This extension brought the route across the bay via an existing ferry service, and US 50 replaced much of US 213 and portions of MD 404 on the Eastern Shore. As a result of US 50 being routed onto the Eastern Shore, US 213 north of what is now US 50 was removed from the U.S. Highway system, and became the current MD 213 by the late 1970s. Once the original two-lane span of the bridge was completed in 1952, it replaced the ferry, which had been in service since the 1930s. The John Hanson Highway, named for John Hanson, was the first section of US 50 to be upgraded to a freeway in Maryland. It was completed soon after the Bay Bridge was built, and the older alignment was redesignated MD 450. A slight extension of MD 450 was then built to reconnect it with US 50 near the present-day intersection with MD 2. High volumes of beach traffic as a result of the Chesapeake Bay Bridge made further upgrades to the route necessary. A very straight alignment south through Talbot County was built, the former alignment becoming MD 662. In Salisbury, US 50 was moved from Main Street to Church Street. In Worcester County, its present-day alignment was built, though only dualized east of US 113 in Berlin. Following this, in the mid-1960s, the present four-lane section of US 50 was completed between Salisbury at then-US 13 and Berlin at US 113, its old alignment east of East Main Street becoming MD 346, and Church Street was returned to the city. The rest of US 50 on the Eastern Shore was in the process of being dualized at this time. This included the adjacent span of the Chesapeake Bay Bridge built in 1973, widening the thoroughfare to an asymmetrical five lanes. In 1991, just as the final two-lane section of US 50 was falling into severe disrepair, Vienna was bypassed to the northeast, completing the dualization of the eastern section of US 50. The drawbridge was then dismantled, and portions of the old road were designated MD 731. The designations have been rolled back over time, however, and MD 731 is no longer signed. The 1990s also saw two extra lanes added to the John Hanson Highway in both directions as it was upgraded to enter the Interstate Highway System, being granted the Interstate 595 designation. However, the Interstate 595 shields were never installed on the highway; although the sign gantries installed during the upgrade contain space for the I-595 shields to be installed, this never happened to prevent motorist confusion, and as a result the designation is only used internally. The freeway portion was extended to the Eastern Shore, from the Chesapeake Bay Bridge east to the US 50/301 split in Queenstown. The US 50/301 portion of the Blue Star Memorial Highway was upgraded to a freeway mostly during the late 1980s and early 1990s; prior to this it was only a divided highway with several local roads intersecting it. After being upgraded, many of these intersections became sharp right-in/right-out ramps. The most recent upgrade to US 50 came in October 2002, when the Salisbury Bypass was extended to circle the north side of the city. US 50 was rerouted onto this, and the alignment within the city, already bypassed numerous times, became present-day US 50 Business. Interstate 595 (I-595) is an unsigned number for a section of the John Hanson Highway (US 50 and US 301) from I-495 (Capital Beltway) east of Washington, D.C., to Route 70 (Rowe Boulevard) at Annapolis, Maryland. The John Hanson Highway, US 50's route between Washington, D.C., and Annapolis, was constructed in 1957, and ran from New York Avenue just outside Washington, D.C., to MD 2, the Ritchie Highway, north of Annapolis, connecting to the western approach to the Chesapeake Bay Bridge. The highway was four lanes throughout, and connected to the Baltimore-Washington Parkway, I-495 and US 301 with full-cloverleaf interchanges. In the 1980s, the John Hanson Highway was planned to be designated as a part of I-97 between the Capital Beltway and the current I-97 interchange and as Interstate 197 between I-97 and MD 70. In the early 1980s, the I-595 route number was proposed for a connector in Baltimore from I-95 to what was then called I-170, which was left stranded from the rest of the Interstate Highway System by the cancellation of I-70 within the city limits of Baltimore. That connector was never built, and I-170 has been redesignated as part of US 40. Due to the increasing use of the highway and the dangerous conditions at the interchanges with the Capital Beltway and US 301, the highway was reconstructed to Interstate standards between 1990 and 1995 between the Capital Beltway and MD 70 in Annapolis. Funding for the project was released from the cancellation of Interstate Highway segments within Baltimore. Originally, planners intended to designate the reconstructed highway as I-68, but with the completion of the National Freeway in far western Maryland in 1991, the Maryland State Highway Administration chose instead to designate that route as I-68, leaving the John Hanson Highway to be designated as I-595. In January 2001, highway historian Scott Kozel contacted the Maryland State Highway Administration (MDSHA) to ask why I-595 was not signed. They responded with: "We did not feel that either the posting in the field or the noting on a map would serve any useful purpose for the traveling public". At times in 2011, the MDSHA has used the I-595 reference on the CHART website. This seems to be at the discretion of the operator at the time when referencing accidents and incidents on that highway. No official policy change has been mentioned regarding this. At 19.97 miles (32.14 km) long, I-595 is the longest unsigned stretch of Interstate Highway in the entire Interstate system. There are currently plans to upgrade US 50 in Queen Anne's County to a full limited access freeway, the freeway portion ending at an interchange with Maryland Route 404 atop the Queen Anne's/Talbot County border. This comes along with plans to fully dualize the latter highway in the state of Maryland. US 50 passes through West Virginia, Virginia, and Washington, D.C.
173.62 US 50 Bus. east (Ocean Gateway) – Salisbury Eastbound exit, westbound entrance; western terminus of US 50 Bus. 179.25 US 13 north / US 13 Bus. south (Salisbury Boulevard) – Salisbury, Dover Partial cloverleaf interchange with flyover; no access from northbound US 13 Bus. to westbound US 50; west end of concurrency with US 13; northern terminus of US 13 Bus. US 50 Bus. west (Salisbury Parkway) – Salisbury Partial cloverleaf interchange; east end of concurrency with US 13; eastern terminus of US 50 Bus. U.S. Route 50 Business (US 50 Bus.) is a business route of US 50 in the U.S. state of Maryland. The highway runs 6.88 miles (11.07 km) from US 50 on the northwest side of Salisbury to US 13 and US 50 on the east side of Salisbury in central Wicomico County. US 50 Bus. is a four- to six-lane divided highway within and on either side of the central business district of Salisbury, where the highway intersects MD 349, US 13 Bus., and MD 346. US 50 Bus. west of MD 349 is a mid-1950s upgrade of the original highway entering Salisbury from the northwest. The business route between MD 349 and MD 346 was a relocation of US 50 from Main Street built in the early 1960s. East of MD 346, US 50 Bus. is part of the relocation of US 50 between Salisbury and Berlin completed in the mid-1960s. US 50 Bus. was designated when the US 50 portion of the Salisbury Bypass was completed in 2002. US 50PA is the designation for the 0.21 mi (0.34 km) section of one-way southbound Ardwick Ardmore Road from Garden City Drive south to Pennsy Drive in New Carrollton, Prince George's County, where Ardwick Ardmore Road continues southeast as a county road. The route provides access from Garden City Drive and the New Carrollton station to ramps leading to westbound and eastbound US 50. US 50QB is the designation for a 0.10 mi (0.16 km) ramp from westbound US 50 to MD 456 near Queenstown, Queen Anne's County. US 50QC is the designation for a 0.55 mi (0.89 km) unnamed one-way frontage road running parallel to westbound US 50/southbound US 301 from exit 38B of US 50/US 301 to an entrance to US 50/US 301 in Chester, Queen Anne's County, providing access to businesses. US 50UA is the designation for the 0.36 mi (0.58 km) section of two-lane undivided Naylor Mill Road between Milford Twilley Drive and West Road in Salisbury, Wicomico County, intersecting US 50 at a diamond interchange. US 50WA is the designation for the 0.02 mi (0.032 km) section of two-lane divided Riddle Lane from US 50 north to the end of state maintenance in Grays Corner, Worcester County, where Riddle Lane continues north to provide access to MD 707. US 50WB is the designation for a 0.05 mi (0.080 km) two-lane undivided connector from US 50 north to MD 707 in Grays Corner, Worcester County. US 50WC is the designation for a 0.02 mi (0.032 km) two-lane undivided connector from US 50 north to MD 707 in Grays Corner, Worcester County. ^ a b c d e f g h i j k l m n o p q r s t u v w x y z aa ab ac ad ae af ag ah ai Highway Information Services Division (December 31, 2013). Highway Location Reference. Maryland State Highway Administration. Retrieved 2012-09-07. ^ a b c Google (March 23, 2017). "overview of U.S. Route 50 in Maryland western section" (Map). Google Maps. Google. Retrieved March 23, 2017. ^ a b c d e f g h i j k l m n o p q r s t Google (March 23, 2017). "overview of U.S. Route 50 in Maryland eastern section" (Map). Google Maps. Google. Retrieved March 23, 2017. ^ Thomson, Robert (May 21, 2016). "Summer getaways are all about timing". The Washington Post. Retrieved March 23, 2017. ^ Sottili, Carol (May 20, 2010). "How to beat the beach traffic". The Washington Post. Retrieved April 14, 2012. ^ Theobald, Joseph. "Hurricane Preparedness Information". Town of Ocean City, Maryland. Retrieved March 23, 2017. 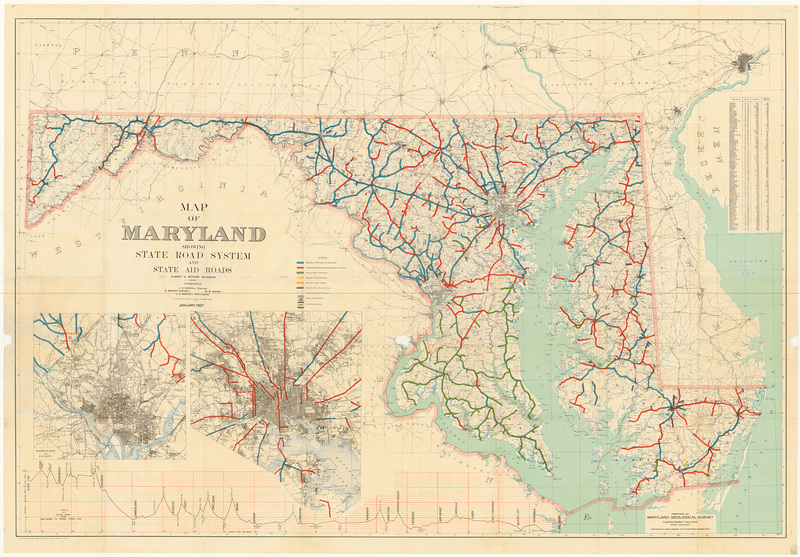 ^ National Highway System: Maryland (PDF) (Map). Federal Highway Administration. October 1, 2012. Retrieved October 30, 2012. ^ a b c "Interstate 595 in Maryland (US-50 from I-95/I-495 to Annapolis)". Roadstothefuture.com. Retrieved 2010-02-06. ^ "Bill Burton Fishing Pier State Park". Maryland DNR. Retrieved November 7, 2016. ^ Dildine, Dave (November 27, 2017). "How did that Sacramento road sign end up in Ocean City?". Washington, DC: WTOP-FM. Retrieved January 10, 2018. ^ Map of Maryland (Map). Maryland State Highway Administration. 1927. Archived from the original on 2008-08-26. Retrieved 2009-03-03. ^ "I-97 and all its 3DI's at it Zenith in Planning circa 1982". 8 February 2004. Archived from the original on 8 February 2004. ^ Google (April 23, 2010). "U.S. Route 50 Business (Salisbury, MD)" (Map). Google Maps. Google. Retrieved April 23, 2010. ^ McCain, Russell H.; Bennett, Edgar T.; Kelly, Bramwell (November 12, 1954). Report of the State Roads Commission of Maryland (1953–1954 ed.). Baltimore: Maryland State Roads Commission. pp. 136–137. Retrieved April 23, 2010. ^ Highway Information Services Division (December 31, 2002). Highway Location Reference. Maryland State Highway Administration. Retrieved October 21, 2010. ^ A Sun Staff Writer (2002-10-23). "$94 million bypass around Salisbury to open today, 6 months ahead of schedule". The Baltimore Sun. Baltimore: Tribune Company. p. 4B. Retrieved April 24, 2010. ^ Google (March 29, 2017). "overview of U.S. Route 50PA" (Map). Google Maps. Google. Retrieved March 29, 2017. ^ Google (March 29, 2017). "overview of U.S. Route 50QB" (Map). Google Maps. Google. Retrieved March 29, 2017. ^ Google (March 29, 2017). "overview of U.S. Route 50QC" (Map). Google Maps. Google. Retrieved March 29, 2017. ^ Google (March 29, 2017). "overview of U.S. Route 50UA" (Map). Google Maps. Google. Retrieved March 29, 2017. ^ Google (March 29, 2017). "overview of U.S. Route 50WA" (Map). Google Maps. Google. Retrieved March 29, 2017. ^ Google (March 29, 2017). "overview of U.S. Route 50WB" (Map). Google Maps. Google. Retrieved March 29, 2017. ^ Google (March 29, 2017). "overview of U.S. Route 50WC" (Map). Google Maps. Google. Retrieved March 29, 2017. Wikimedia Commons has media related to U.S. Route 50 in Maryland.